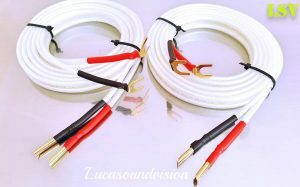 2 x 2.5m (Pair) QED RUBY ANNIVERSARY EVOLUTION Audio Speaker Cables Terminated. If you would like a different combination of spade connectors to airloc plugs, or different cable lengths, please ask. Please have a look at our other items, Any questions please contact with me.Thanks for looking.